Looking for a recap of the East Coast tryout? It’s here. SAN LUIS OBISPO, Cali. — With the chance to earn a spot on one of the USA Under-24 delegation’s teams competing in Heidelberg, Germany, this summer on the line, over one hundred athletes made the journey to California to showcase their skills. Due to a higher volume of tryout invitees based in the Eastern US — and a need to keep the two events roughly even in size — players from as far away as Indiana, Minnesota, and North Carolina made their way out west for the tryout. The challenges for the candidates (as well as the staff) began before anybody had even cleated up: poor air quality from wildfires raging up and down the state prompted USA Ultimate to relocate the event three hours south from the Bay Area to San Luis Obispo. With air quality in the Bay causing professional, collegiate, and youth sporting events to be postponed1, USA Ultimate was forced to choose between a logistical contortion or full cancellation of the event. One of the few geographic locations available with playable air quality was SLO2. Fortunately, Cal Poly-SLO had already reserved fields for the weekend to host the West Mixed College Regionals event, and their club leadership was able to work with the USAU staff to support the last-minute event3. The format of the tryout was largely similar to that of its east coast counterpart from the previous weekend for on-field activities. With roughly 50 men and 50 women in attendance, both the men’s and women’s coaches worked with segments of 25 players while the mixed staff were charged with a larger 50-person group. The groups rotated in blocks throughout the days. The length of the session did differ from the previous week: to account for the short notice and the drive time down from the Bay Area, the Saturday tryout went from 12pm to 7:45pm and the Sunday session ran from 8am to 12pm. The Men’s and Women’s stations featured a heavy emphasis on smaller-sided games, often with scripted beginnings (starting on the trap sideline or without a reset behind the disc) or special rules (shorter stall counts, no backward passes, or five passes to score) to force players into unfamiliar scenarios. The games ranged in size, often starting out on a “mini” sized field but progressing to a nearly-full-sized pitch while maintaining the 4v4 or 5v5 dynamic (but also eventually giving way to standard 7v7). A particular point of note in the Men’s drills was how much leeway the coaches gave the players to define strategy within their teams, while observing and listening to the player interactions. The players would be presented with a scenario or rule tweak and be prompted to strategize within their teams while the four coaches moved between groups to listen. Clearly, there was a premium being played on strategic acuity, strong communication skills, and effective collaboration. While the single-gender divisions seemed to put the onus on the players for collaborating on sets and strategy, the Mixed stations had more teaching elements to them. On Saturday, the coaches laid out a particular reset scheme for the players to learn together and watched to see how well the players were able to effectively run the set. Later on, they defined a preferred endzone set and drilled it repeatedly. And, of course, like in the other divisions, there was a healthy amount of full field play, albeit 6v6 instead of 7v7. Though the single-gender stations and mixed stations may had been different in terms of their content, one element in which the stratifications changed was in the tone and volume of the respective camps. While the Men’s Division cultivated an environment of quiet intensity, the Mixed and Women’s stations were clearly focused on creating an audibly and visibly enthusiastic atmosphere. From a historical perspective, it’s interesting to see how the tryout format has changed over the years, likely for the better. As time has gone on the coaching staffs have trended more toward “live” ultimate (with slight modifications) while moving away from “skill games” (elimination marking, jump ball tournaments, marathon throwing drills) that have been featured in past iterations. After declining to apply last cycle, Sol Yanuck (Carleton) made the trek from North Carolina and immediately made his presence known with pinpoint flick hucks and his trademark smart defense. Coming off a college campaign that saw him named a Defensive POTY Runner-Up, Leandro Marx (Oregon) lit up the field on both sides of the disc with big hucks and relentless defense. Playing on their home turf, Nathan Pettyjohn and Caleb Merriam (Cal Poly-SLO) made some noise. Pettyjohn paired his superior athleticism in the air with smart defense and sharp throws while Merriam left broken marks all over the pitch. Fresh off semifinal appearances at both the club and college level, Ted Sither (Oregon) was one of the most impressive handlers at the tryout. He showcased the ability to make high difficulty throws as well as consistently attack from the reset space. Speaking of the attacking from the handler space, sophomore Harry Wolf Landau (Carleton) played beyond his years with incisive downfield shots and squirrelly handler moves. With apologies to Landau and Yanuck, arguably the most impressive CUT player in the field was Luke Webb (Carleton). He made athletic plays downfield and hit on some big throws. A potential returner from last cycle, Will Lohre (Oregon) looks to be a lock to make his second U24 appearance. He was unguardable in the cutting lanes. Coming off a strong club season with Sub Zero, Nick Vogt (Wisconsin) was formidable all weekend. Already known as an ace defender, he showed off a well-rounded offensive game to boot. One of the coolest parts of U24 is seeing how the stars from smaller programs stack up with those from the more storied teams. Connor Olson (Oklahoma State), Jake Reinhardt (Texas State), and Kyle Henke (Texas Tech) all proved that they have the athletic chops to hang with the country’s best. On the subject of the South Central region, Noah Chambers (Texas) turned in a solid weekend, holding his own against fellow talented bigs like Jeff Weiss (Chicago). One of the best all-around stars in the field was Sam Cook (USC). He made play after play on the weekend, from layout blocks on defense to big grabs in the air to every-other offensive possessions. In a fitting curtain call for his College Offensive POTY Runner-Up season, Steven Benaloh (Washington) reminded everyone that he still has a rocket flick huck and can grind out resets against ace handler guards. 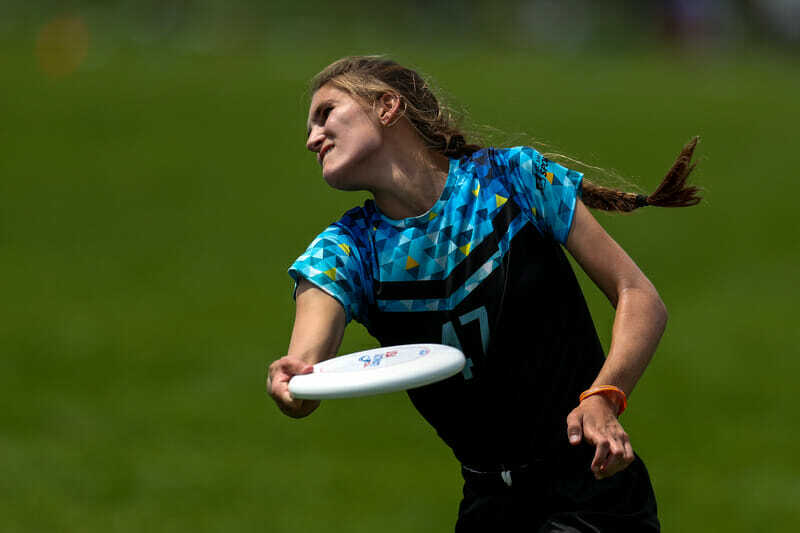 It should come as no surprise that U24 veteran Ella Hansen (Oregon) proved herself as one of the most gifted throwers at the tryout. Though she may have turned a few more than she would have liked, she stretches the field in a way that few other throwers can. After a key role in Wildfire’s Cinderella run to the Club quarterfinals, Dena Elimelich (UC San Diego) turned in an impressive weekend. Her size and athleticism make her a force as a cutter and on the mark. Look out for Carleton Syzygy this season. In addition to returning a wealth of youth talent, they picked up three of the most impressive freshmen from the tryout. Carly Campana (Carleton, U20) was a dominant cutter, Kate Lanier (Carleton, U20) played with the poise and skill of a senior handler, and Karen Ehrhart (Carleton) showed off a dynamic skill set both on the disc and downfield. Ultiworld’s 2017 Club Women’s Breakout POTY Runner-Up Shayla Harris (Stanford) was one of the most athletic players on the field. He speed and incredible leaping ability drew exclamations from observers a field away. Coming off a college season where she was named the New England Region POTY, Mia Bladin (Harvard) stood out. And, yes, you read that right. The New England POTY did not go to Dartmouth. Bladin showed why at the tryout with her well rounded game making her a threat in any situation. Perhaps a lesser-known name in the college women’s division, Robin Fassett Carmen (Colorado College) caught our eye this weekend. Her size and athleticism make her a brutal cutter matchup. In the same vein of lesser-known names, 2018 Donovan Award nominee Helen Eifert (St. Lawrence/NAU) was a standout defender on the weekend. Playing just an hour away from her home field, Julia Kwasnick (UC Santa Barbara) was one of the best defenders in the tryout. She’s athletic and tall and looks to have stepped up her game even further after a club season with San Francisco Mischief. Jamie Eriksson (UT-Dallas) of Dallas Public Enemy turned in a solid weekend on the strength of her strong cutting. After a 2018 Callahan nomination, Laura Gerencser (Texas) acquitted herself well at tryouts. She looked confident and poised behind the disc all weekend. Another big-program name, Sarah Mondschein (Wisconsin) showed off a dynamic two-way game. One of the most intriguing players to watch in the field, Sadie Jezierski (Ohio State), made a fair case for herself. Though she didn’t make the initial tryout list, her abilities are undeniable. However, she does play a fairly ball-dominant style. It will be interesting to see how the coaches decide to handle the decision of whether or not to roster her. Comments on "USA U24 Tryouts 2018: West Coast Recap"